Having been abandoned by a mother who can’t love like a normal mom, fifteen-year-old Sarah-Mary and her eleven-year-old brother Caleb live with their Aunt Jenny in Hannibal, Missouri. And even though Sarah-Mary is normally a rule-abiding, responsible girl, her best friend Tess Villalobos convinces her to exchange school for a road trip to St. Louis to see the Gateway Arch. While there, a mild case of claustrophobia and acrophobia overwhelms Sarah-Mary. Because she passes out, she is found out, so her aunt tightens the rules and sends Sarah-Mary to Berean Baptist, a strict private school, not only to teach her the value of discipline but to separate her from Tess and the temptation of negative influence. Unsure whether she has been sentenced to hell or prison, Sarah-Mary craves her freedom and wishes to make her own decisions about how she lives. Due to a series of coincidences, Sarah-Mary–who prides herself in keeping her promises–vows to help Sadaf Behzadi, a Muslim fugitive, when her brother Caleb, who is sensitive and deeply cares when other people hurt, convinces his sister that it is the right thing to do. The promise sets in motion an adventure for which Sarah-Mary is largely unprepared. Using tact and timing to stretch the truth and performing under the pretense that she is hitchhiking to Canada with her Aunt Chloe from Portugal, Sarah-Mary takes the reader on a journey of enlightenment. 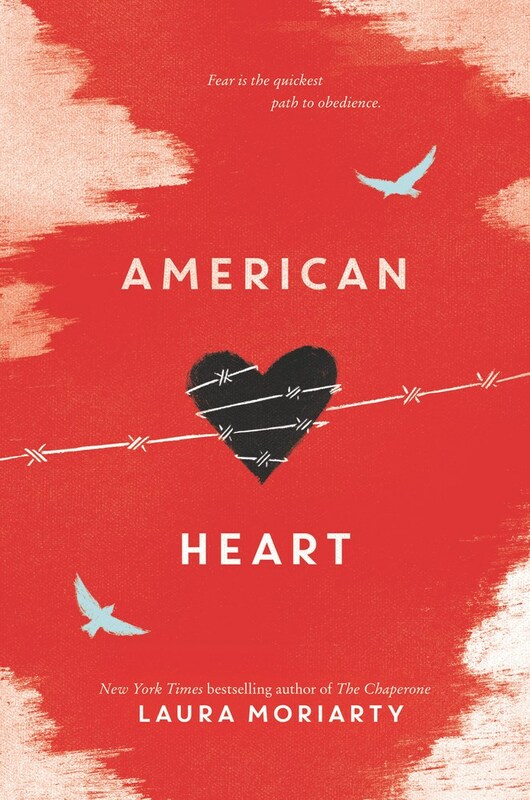 We learn some differences between Sunni and Shia Muslims, about the practice of prayer, and about what it means to have an American heart, even if you are born somewhere else. But this cross-country trek involves more than Muslim myth busting. As the two women accept rides from an African American family, a group of Amish, and a woman with Mexican immigrant parents, the reader grows along with Sarah-Mary, who unlearns many of her profiling habits and her parochial views about ethnic identity and religious views. Her willingness to examine her biases is an important step in understanding the roots of stereotypes and prejudice that exist in society. Sarah-Mary also learns that misery isn’t a movie and that when somebody looks and talks like the majority, that individual is more readily accepted, but for those outnumbered, it’s more difficult to find a place of belonging. American Heart by Laura Moriarty is an important book for today’s young adult because it enables readers to see other people’s experiences, to walk into worlds they might not otherwise have imagined, and to see their own experiences reflected back at them. Readers learn that being born into a different family or a different country can make all the difference for a person. We also experience the marginalization and harassment faced by those who are different, who do not fit mainstream definitions. Reflective of our ever-growing diverse society, Moriarty’s book represents different ethnic and cultural groups and has potential to stretch our vision of ourselves and our world. By reading novels that focus on cultural identity, readers are better prepared to notice differences, think critically, consider alternate positions, and make more informed, ethical choices. A catalyst for sparking conversations on complex social issues like religious and ethnic diversity and the effects of prejudice and parochialism, American Heart is also similar to Alan Gratz’s novel Code of Honor, Maria Padian’s Out of Nowhere, and Hostage Three by Nick Lake—all books that raise social consciousness and invite collaborative conversation about tough topics. These novels also encourage ally behavior, to use our time and resources to change the status quo. One person alone isn’t enough, but together we can make a difference in the world. Tagged difference, diversity, marginalization. Bookmark the permalink.